Picture yourself as a professor whose ideals conflict with a student’s. What lengths would you go to in order to stay true to your beliefs? How far would you go to protect yourself, or achieve success, if it meant betraying your ideals? How would you recognize it if you already had? Now, imagine that you are a student whose beliefs challenge your professor’s authority. You follow your beliefs completely, but you take extreme measures. You ruin everything the professor has worked for. How would you justify your actions? Both the professor and the student end up in a sticky situation, so which would you rather be? In the end, whatever side you take, you’re wrong. David Mamet’s Oleanna explores such profound questions and the invisible battle lines drawn within the professor-student relationship. 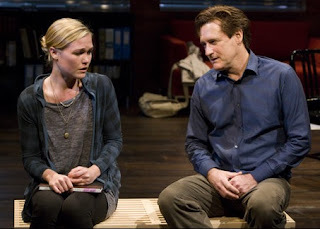 Bill Pullman and Julia Stiles, who play John (the professor) and Carol (the student), both give tremendous performances in this stunning look into the complexities of academic hierarchy. 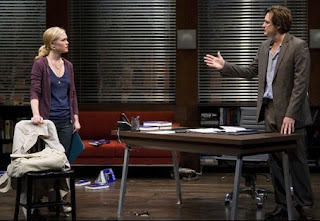 The entire play takes place in the John’s spacious office and opens as he answers a phone call while Carol waits to speak. The first act can be difficult to follow because most of the dialogue is delivered in fragments. We soon discover, however, that John is in the process of gaining tenure. Meanwhile, Carol is distraught because she is lost in the classroom and refuses to fail, at least not without a fight. A simple discussion about Carol’s grades and her inability to understand John’s book escalates into an argument about his teaching methods. Soon enough, the roles are reversed and Carol gains more control over the situation than John or the audience expects. According to her, John is guilty of sexual exploitation and now runs the risk of losing his job. At this juncture, both are sharply abused by the other and push one another to the brink of sanity and us to the edge of our seats. The script blazes with brilliant discourse fired from both characters. As the audience, we become emotionally invested and take sides, but we find it difficult to completely support either character. As Carol provokes John, we understand his anger, and as he attempts to pacify and patronize her, we feel her degradation. One wonders if John is right about education when he says that it is just “prolonged and systematic hazing,” and one considers Carol’s right to doubt his ability as an educator. How can he conceive of such an idea while teaching those who hope to learn? It is all a matter of power—who has it and who can manipulate it to his or her advantage. Oleanna makes immense social and political commentary. Mamet compels us to critically view the educational platform and see that the same problems exist in every leader-subject dynamic. It is no coincidence that the play, originally written in 1992, was Mamet’s response to the highly publicized Anita Hill - Clarence Thomas hearings. Thomas, currently an Associate Justice of the United States Supreme Court, came under fire during his 1991 confirmation hearings when Hill, an attorney who used to work for him, testified that he had sexually harassed her. He was confirmed despite the allegations, but the truth behind them is still debated to this day. Oleanna is an intensely powerful show sure to provoke the mind of any audience member.